spring 2014 session; Radio Tap tickets are here! Our current 10-week winter session is coming to a close (hopefully, along with this cold winter weather!). You have 2 weeks left to make up any missed classes before we begin our new 10-week spring session March 18-May 22. Save when you register for both jazz AND Pilates: $260 for the session (a $40 savings!)! Pay in person at class or through Paypal. Tickets are available through Cadance and Klaxson studios and dancers. Contact us to get your tickets now! 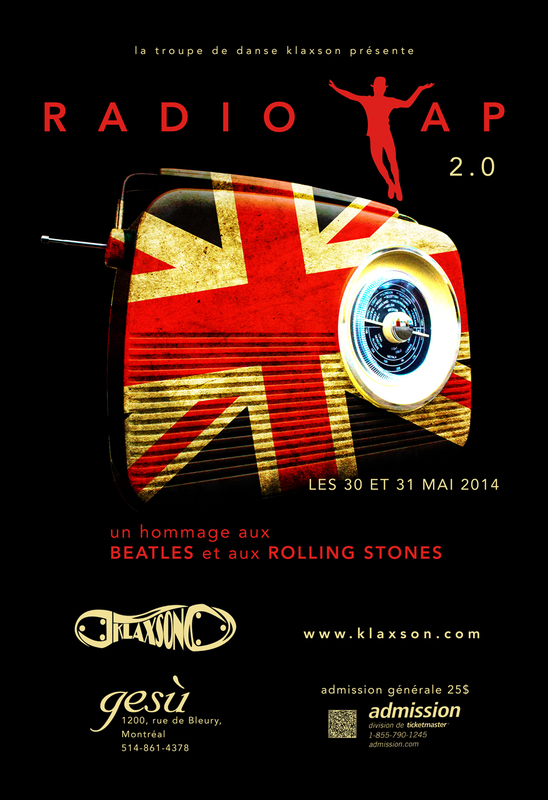 KlaXson Tap Dance School returns with its seventh production, Radio Tap 2.0! This second edition pays tribute to the legendary British invasion groups, The Beatles and The Rolling Stones. The show features tap dancers from KlaXson (www.klaxson.com), swing dancers from 88swing (http://www.studio88swing.com), break dancers from Miroir Miroir Dance Company and jazz dancers from Cadance Jazz. With 84 songs, Radio Tap 2.0 will take you on an exciting journey into the musical heritage of these two iconic bands. L’école de claquettes KlaXson est de retour avec son septième spectacle, Radio Tap 2.0! Cette deuxième édition rend hommage aux intemporels groupes musicaux britanniques, les Beatles et les Rolling Stones. Le spectacle présente les danseurs de claquettes de KlaXson (www.klaxson.com), de même que les danseurs de swing de 88swing (http://www.studio88swing.com), les breakers de la troupe de danse Miroir Miroir et les danseurs jazz de Cadance Jazz. Avec un total de 84 chansons, Radio Tap 2.0 vous invite à redécouvrir le patrimoine musical de ces deux groupes légendaires. Previous Post Shirts, pants, and hoodies, oh my! !